March 2018 – on my way: make it someday. 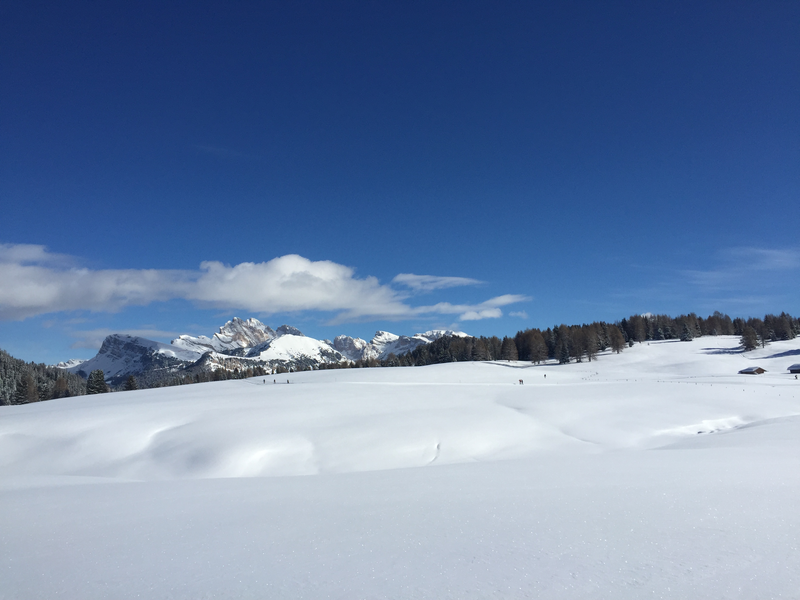 Seiser Alm and perfect ski vacations. I’m seriously late with this trip report, but no matter. I want to tell you about a trip I took back in early February. Earlier this winter, when I realized that I was not going to the Olympics and thus had more time to play with in Europe (ha! only kind of! I need to finish my dissertation! 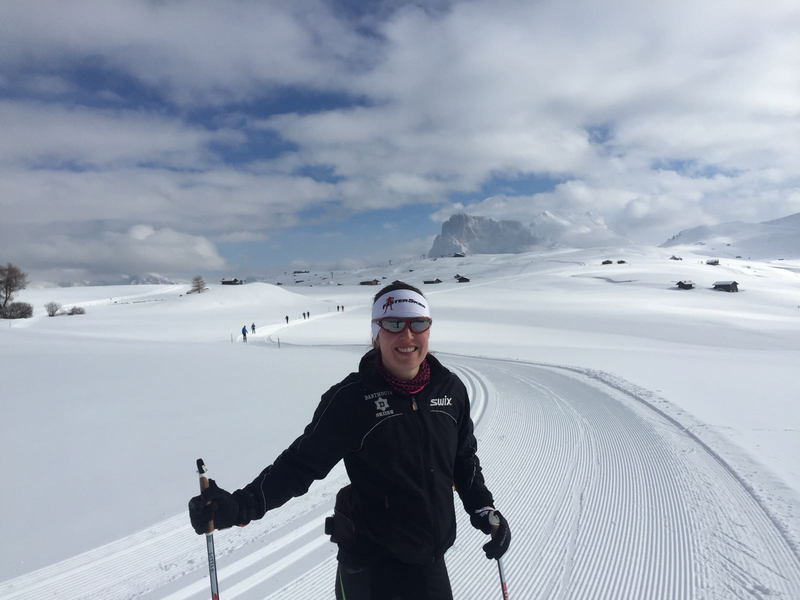 ), I asked on Facebook: what were my friends’ favorite places to cross-country ski in Europe? Places that I shouldn’t leave next fall without having visited? Yes, I am in that mode. I anticipate defending my PhD in September, which means that I am looking for postdoc positions and in all likelihood I’ll be headed back to North America. It’s not that I’ll never take another ski trip in Europe, of course, but doing so will be a lot harder once I’m based on a different continent. There is such a world to explore here, and I’ve had so many great trips and experiences – many of which you can read about on this blog, like this, this, or this – but there are so many places that I still want to go, and not enough time to visit them. So I wanted some help narrowing down my list. Seiser Alm isn’t all that hard to get to, if you’re coming from afar. Go to Milan, take a train to Bolzano, and then it’s a quick bus ride to Seis/Siusi, the town below the plateau. 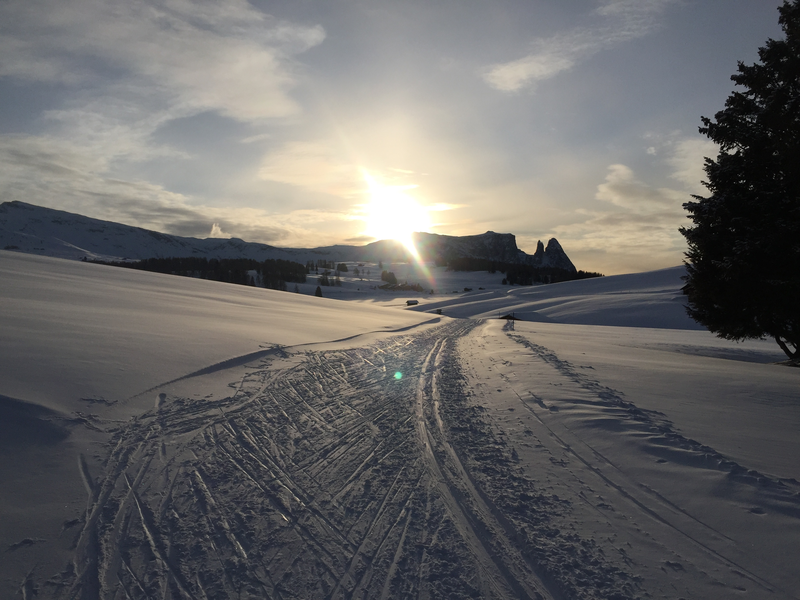 You can stay there and take the cablecar or bus up to the plateau of Seiser Alm/Alpe di Siusi every day to ski, or you can travel up the big hill and stay up there, for example in the village of Compatsch, as we did. 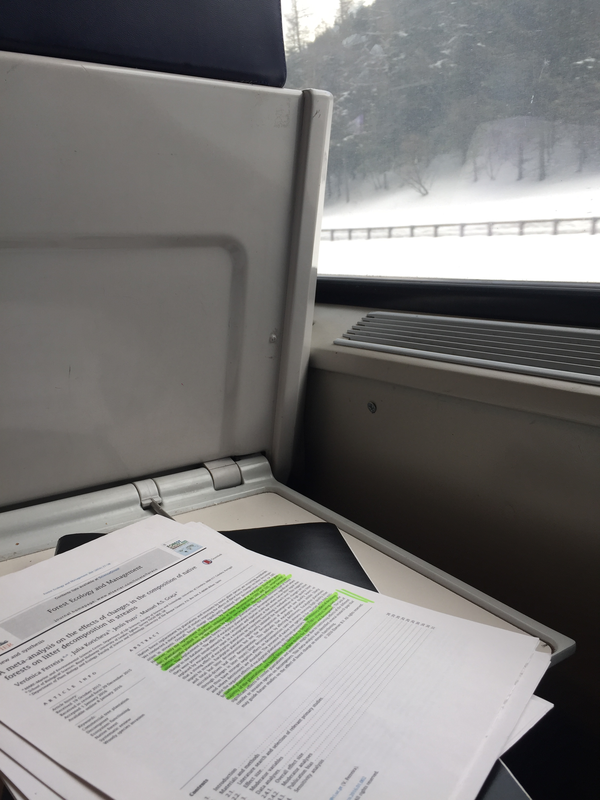 Pro tip, do some work on the train. The reason I hadn’t been to Seiser Alm so far, however, is that if you are coming from the north it is not so convenient. With a car, it’s probably not that bad. I don’t have a car, however, so the trip was a long combination of train and bus connections. Crossing the Alps is never a simple feat and I took the train into Austria, then another train to the top of a pass, then a another train down the other side of the pass into Italy, then a bus from Brixen/Bressanone to Seis/Siusi*, then the cablecar. I had wanted to take this trip before, but the logistics put me off. From Zurich it’s literally as fast to fly to Oslo and then take a train to Lillehammer, as it is to take public transportation to Seiser Alm! I’m bad at writing blog posts, because my introductions are always longer than the meat of the post. But here, I’ll finally get to the point: I took a few days off work and made it a long weekend, reserved a hotel, and traveled to Seiser Alm. I went with my boyfriend, who had never cross-country skied before. I was hoping he wouldn’t hate it, and figured that if I wanted him to love my sport, I might as well introduce him to it in the awesomest place I could think of. Because of all those logistics, we arrived in the mid afternoon. After checking in I immediately wanted to go for a ski before the sun went down, so I grabbed my skate skis and headed out. It had snowed the day before and the grooming was imperfect for skating (classic would have been better, but I didn’t want to take the time to pick and apply kickwax, I just wanted to get out there). But it was beautiful. Everything I had dreamed of. And I had plenty of time to appreciate the scenery, because skating through the powder up some big climbs at 1800 meters of elevation (around 6,000 feet, and higher once I went up some of those big climbs) is really hard. I just skied until the sun was setting, maybe an hour and a half, but I was already pooped. Luckily, I could refuel. Our hotel was delightful. As is probably the case for most or all of the hotels in Compatsch, half-board is the default: breakfast and dinner are included in the room rate. That’s because Compatsch is a tiny, tiny village at the top of the cablecar. There are a handful of hotels, some of them fairly big, but maybe only two or three bars/pizza places that aren’t associated with hotels. There’s just not many other places you are going to eat, and the hotels aren’t really going to get dinner guests who aren’t staying up there because the cablecar stops running at 6 p.m. and you aren’t allowed to drive up to the plateau unless you are staying there (which makes the plateau very nice and quiet!). So, half-board makes sense for everyone. The dinner was superb, including a great salad bar, some handmade pasta (of course), and a *dessert buffet*. I generally try not to eat dessert, but this was too much to resist. When I saw the 70-something-year-old German guy from Hamburg who was sitting at the table next to us get up and choose a second dessert, I decided that’s what I should do too. Yes, even if you don’t count the phenomenal skiing, I was spoiled on this trip. The next day we enjoyed a similarly great breakfast, and then set out to ski. That first afternoon I had remembered how exhausting it is to skate at altitude. I haven’t been doing a lot of skating this year because I’m still recovering from an ankle injury that has really affected my mechanics, so I had somehow forgotten that fact. So we stuck to classic skiing. After the moody weather of our arrival day, it dawned bright and sunny. I slapped some blue hardwax on my skis, we rented some skis for my boyfriend, and set out. Same view, this time with A+ grooming. I can hardly explain how spectacular it was. 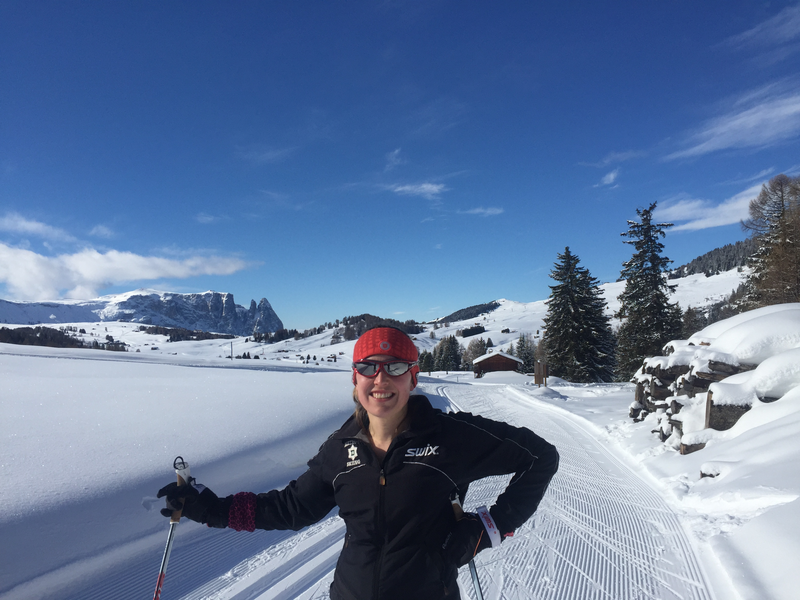 I tried to be a good teacher but was distracted by the scenery, the perfect conditions, the feeling of sun on my skin (we hadn’t been getting a lot of that in Zurich). Every few minutes I would look around and grin, and sometimes spread my arms like, can you believe this? From Compatsch, it is a few kilometers up to Ritsch, which is the true center of the trail system. From there, there’s a few kilometers of easy, rolling trails (and actually even a one-kilometer “practice loop” which is totally flat). 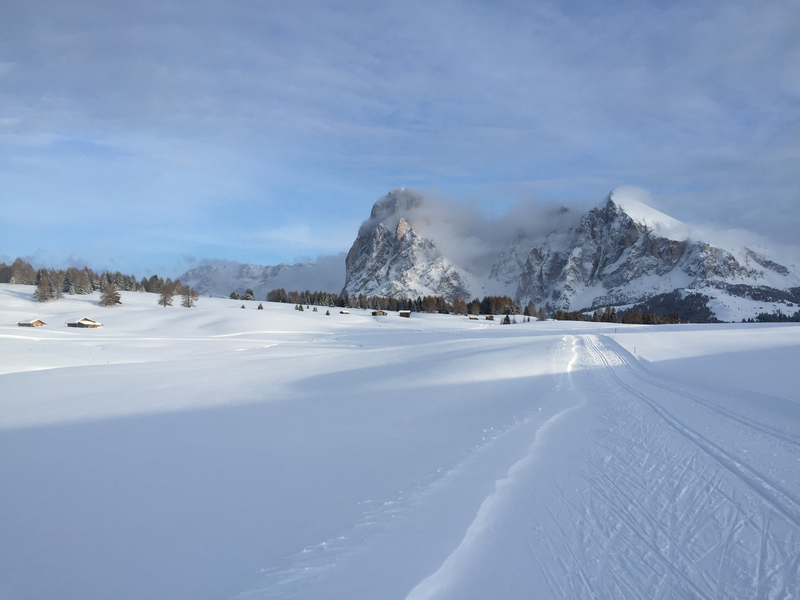 We started there, but continued around the 12-km “Hartl” loop that goes far out the plateau to the northeast, and at its farthest point loops around alpine meadows with overlooks across a valley into Val Gardena. I live in Switzerland, so I’m used to mountains, but the mountains in the Dolomites are totally different. They are made of, well, dolomite, and they are sharp and craggy. I think this is one thing that made me so awed by the scenery: it was just so different than what I was used to seeing. Take my wonder at the Swiss Alps, that feeling I have in Lenzerheide or Gantrisch or even Einsiedeln, and increase it by an order of magnitude, because these mountains are simply not what I usually look at. And throughout the day, the sun plays across them. Different parts are lit up or shaded. Clouds and snow squalls play around the spires. Every time you look is a little different. My boyfriend survived the loop and we stopped in Ritsch for lunch at the hotel/restaurant there, devouring some excellent local-style dumplings. One was made with cheese, another spinach, a third one beets. After replenishing, we parted ways and I skied down into Saltria and cruised around the 6 k loop there. 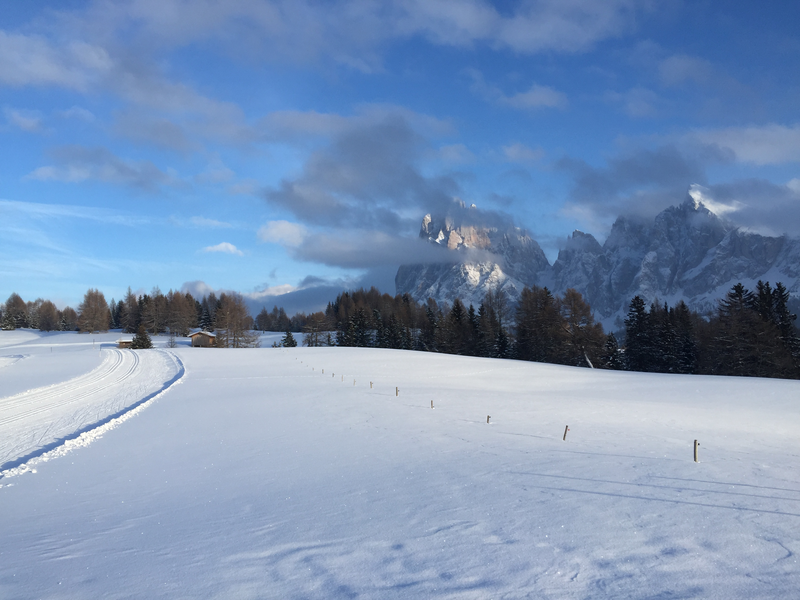 Now is a good time to explain Seiser Alm. It is really just a huge alpine plateau, with hills and meadows, and sharp mountains on several sides. On every edge of this plateau are ski lifts and tiny resorts with a one or two hotels each; many of these areas are accessible from one another, albeit not by steep ski runs. 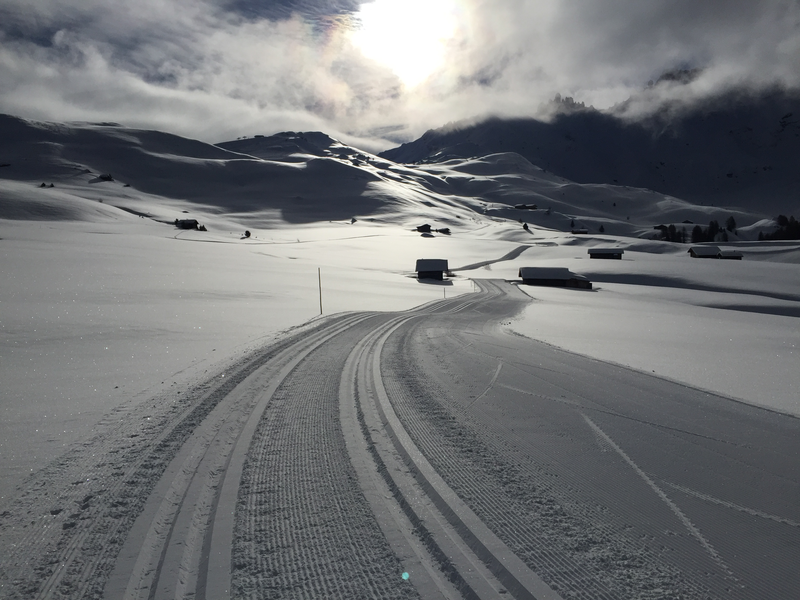 Sometimes the cross-country ski trail would be running parallel to an alpine run, on a gradual downhill across the plateau. Even just in a tuck, on my cross-country skis I would be going faster than the downhill skiers on their heavy equipment, who couldn’t get up a head of momentum on such a gradual hill. Saltria is another medium-sized village, a bit like Compatsch, but nestled down in a mini-valley a bit instead of totally perched on a plateau. To get down to Saltria, I dropped almost 200 meters of elevation in about two twisty kilometers, which was a lot of fun. I then cruised around the medium loop there, which was comparatively deserted and quite lovely, going up this mini-valley along a babbling river/stream instead of offering the bam-bam-bam of the plateau’s mountain views. And then I had to climb back up those 200 meters in two kilometers, which was slightly less fun. Again, I was exhausted. But as I waited hungrily for dinner time, I appreciated the view, again. Perhaps some of the most special views of the spiky mountains are in the morning and the evening. As the light gradually disappeared, the spires were framed in different colors, just there right outside our window. The beauty and the quiet are so striking. 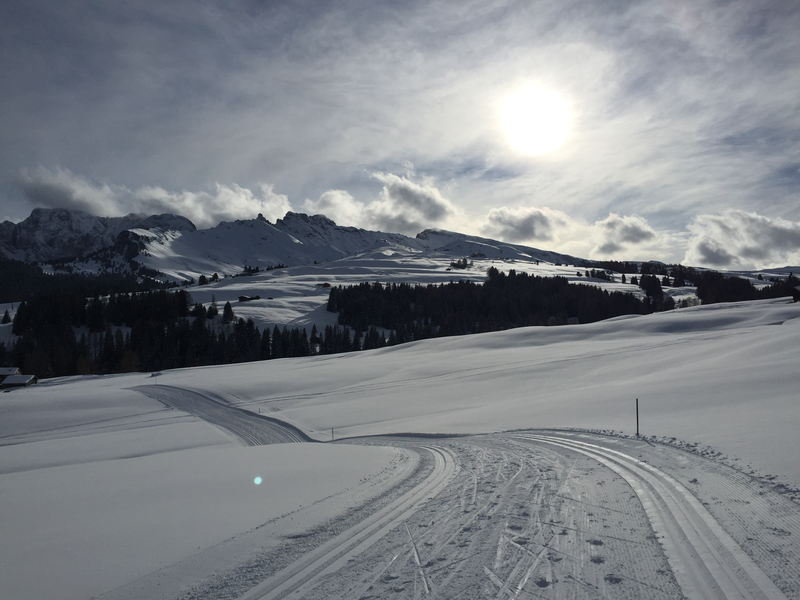 Unless you have a really good reason to do a budget trip, it’s worth spending a little bit more money to stay up on the plateau and experience the mountains through whole days and nights instead of just enjoying the views from your skis during the day. We had another great dinner, after which we sat in the hotel’s lounge area with a couple of beers. We were joined by two German couples, and the two men in the group began playing music on a guitar and singing. They were great, and played songs from several cultures and in several languages. The experience of this type of hotel, where everyone sticks around for meals, is a very different atmosphere from the impersonal settings of bigger resorts, and it was a lot of fun. The next day was again beautiful and sunny, and we skied the “Panorama” loop, in total about a 20 km round trip from Compatsch, with a huge elevation gain. Suddenly you find yourself skiing past the top of a ski lift, an experience you rarely get in the U.S. or Canada! 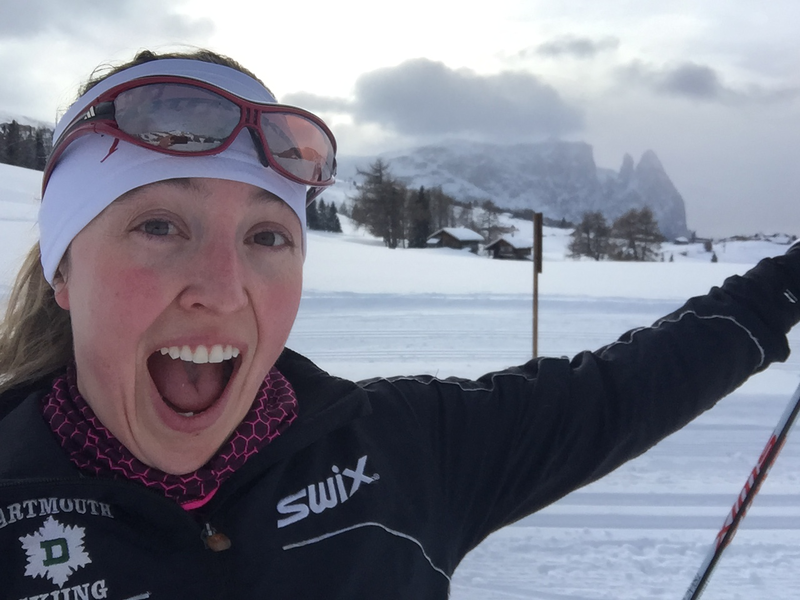 The way that nordic and alpine skiing are integrated into the same space in Seiser Alm (and a few other places I have been, like Font Romeu in the French Pyrenees) is really neat. Groomed winter hiking/snowshoe trails are also embedded into this matrix, so up on the plateau at nearly any point you can look around and see people doing three or four different kinds of recreation. I wish more resorts would do this, instead of making these all totally separate activities, each with their own “area”. It’s great to be able to use the same space, and simply provides more terrain for everyone – why is that not a win/win!? The panorama loop indeed offers spectacular panoramas. Again I was on blue hardwax, cruising around perfect classic tracks. I just couldn’t believe how lucky I was. Perhaps because we set out directly after breakfast, we encountered relatively few other skiers, particularly in the outer parts of the loop. 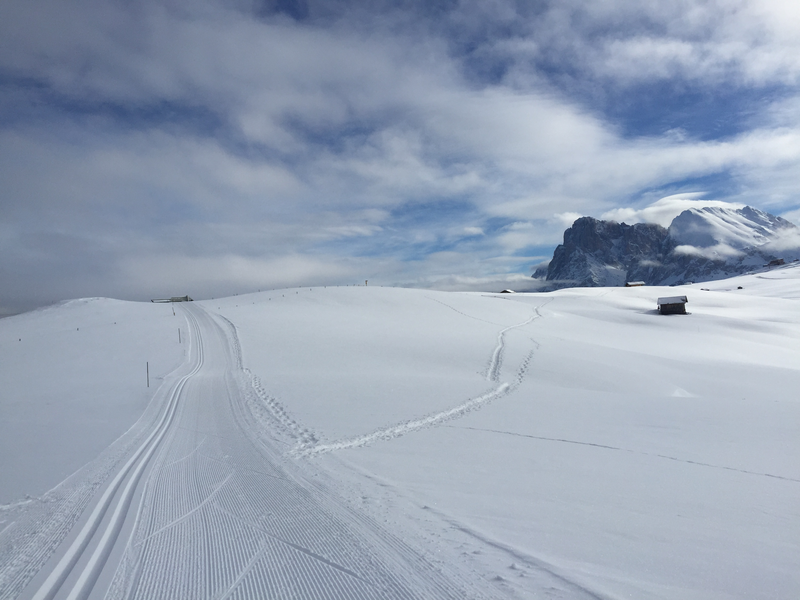 The loop was so great that I went back the next day, when I skied as much as I could – the Panorama loop, the other loop overlooking Val Gardena – before reluctantly putting my skis back in their bag, getting on the cablecar, and starting the long journey home to Zurich. 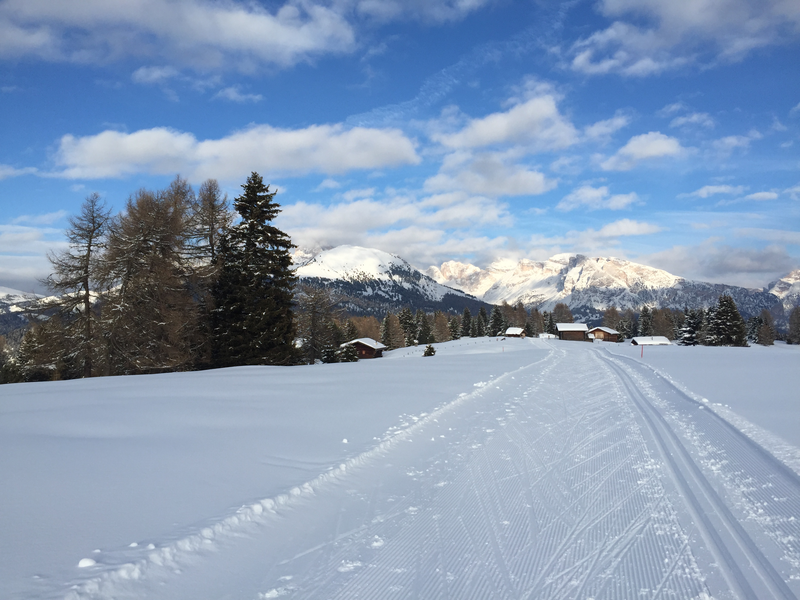 I had skied about 30 km each day, on average, and I was satisfied, exhausted, sore – but wished I could have just stayed and kept skiing. 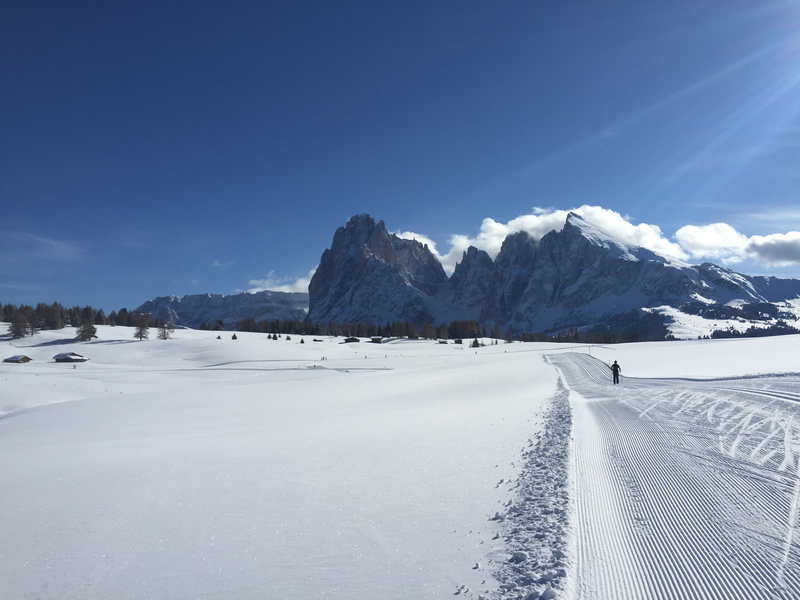 I know exactly why so many people, from the world’s best skiers to that old guy from Hamburg who told us that he comes to Seiser Alm for two weeks every year, want to go there. I can’t wait to go back, even though it might be five or ten or twenty years before I have another chance. Not only the snow, but that handmade pasta and an excellent glass of wine are waiting for me when I do. *Why does everything have two names? Südtirol is an interesting region with an interesting history. It’s currently an “autonomous province” of Italy, but more than half the people living there speak German as their first language. Here’s a link to the Wikipedia explanation of the region’s history, and a link to a 1927 article in Foreign Affairs stating that “the German South-Tyrol and its people are purely German. Never in history has the Brenner been the frontier of Italy… Italy nevertheless has an international obligation with regard to the rights of the German population of South-Tyrol.” That article is obviously not completely unbiased, but it’s quite interesting to read.